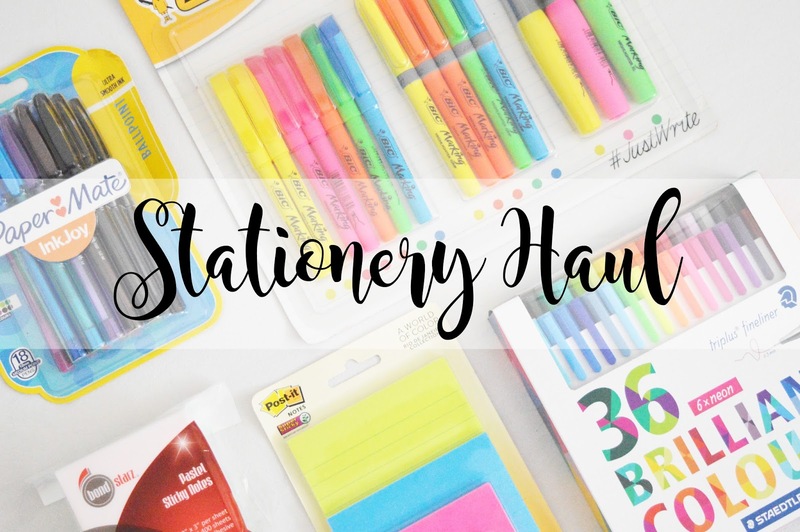 So it's mid October, and we all went back to education a month ago, but this doesn't mean you still can't buy more stationery even though you went on a spending spree back in August ready for the new Academic year! I love stationery, there is no doubt about it. If I see pens, I want to buy them, even if I don't need them. They're pretty, they are colourful, and I will find a way to use them at some point in my life. I've found they're perfect for studying at University, to colour code different topics and the most important aspects of a module too. I hunted absolutely everywhere for these Staedtler fine liners and finally found them. How beautiful are these?! I saw these back in August and was umming and urring whether to get them or not, and I waited two months to eventually go back and get them after finding out they were out of stock absolutely everywhere. I thought these would be absolutely perfect for planning blog posts, taking notes at University on different areas of a topic and for mindfulness! Plus they add a lot of colour to your stationery collection! Sticky notes are absolutely perfect for university and adding that pop of colour to your studies. I use these for absolutely everything and I can never have too many either! I find sticky notes great for separating sections of a module and to highlight the key points of a text without highlighting all over a text book. I picked these up from Asda for £1.50 I believe and the pastel shades make them that little bit more special! While in my previous job, I found paper mate ballpoint pens which are in the triangular shape. These are 100% the best ballpoint pens I have ever used. They're so lovely and smooth to write with, they don't cut out on you even if they're brand new and the quality of them is amazing while leaving no transfer on the page if the ink is wet. If you have never tried Paper Mate pens, then I highly recommend going to your nearest Supermarket and checking them out! I picked these up in the sale for £1.99 from £5 I think. Bargain! So, I already picked up square pastel sticky notes, but they clearly weren't enough! I wanted to find something a little bit bigger than the usual small square sticky notes which you find absolutely everywhere! I found these in Asda for £2 which were on sale and I couldn't help but put them into my trolley! They're brightly coloured, they stand out and they come in four different sizes which is perfect for blogging, studying at University and my job in a primary school. I also found these BiC highlighter set. These were originally £5, and I picked them up for £1.99 or below (I can't remember the exact price) but they were definitely less than £2! Highlighters are wonderful, I use them to highlight blog posts in my notebook which I have already wrote up and scheduled, but I also use them in University for highlighting key points through a piece of text. I also found the children I work with LOVE highlighters, so these are always a treat for them too when ticking their own work after a mental maths test! They're absolutely great, and for less than £2 for 15 highlighters, you can't exactly go wrong. Ilove how bright and colourful all this stationary is, it makes it all so pretty! I have the fineliners and the papermate inkjoy pens, I have to 100% agree I love the inkjoy pens they're so nice to write with!